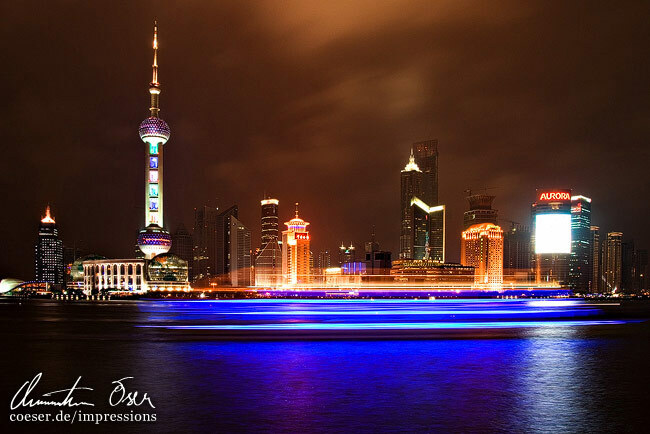 The skyline of Shanghai as seen from the Bund. Die Skyline von Shanghai vom Bund aus gesehen. Panorama view of the city as seen from the Marriott restaurant. Panoramaansicht der Stadt vom Marriott-Restaurant aus gesehen. 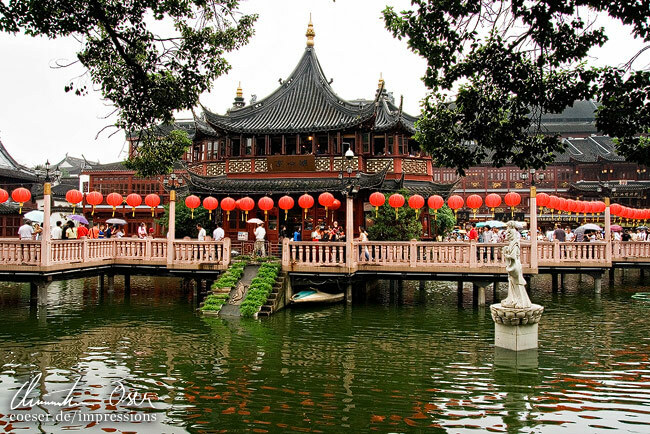 The Yu Yuan Garden with its old tea house and the zigzagging bridge. Der Yu Yuan Garten mit dem alten Teehaus und der Zick-Zack-Brücke. 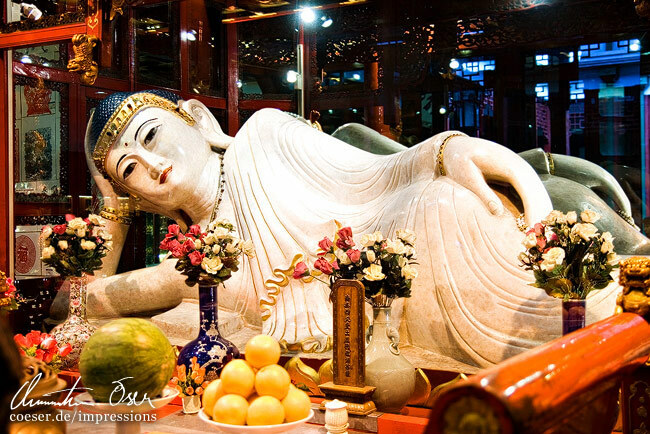 The Jade Reclining Buddha at the Jade Buddha Temple. Die liegende Jadebuddhastatue aus Jade im Jadebuddha-Tempel. 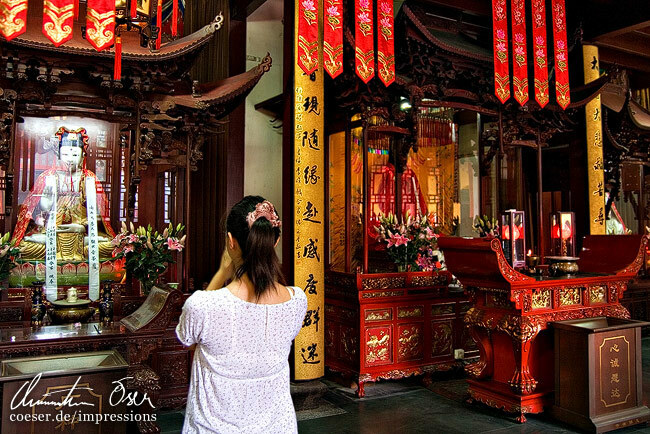 A woman prays in the Jade Buddha Temple. Eine Frau betet im Jadebuddha-Tempel. 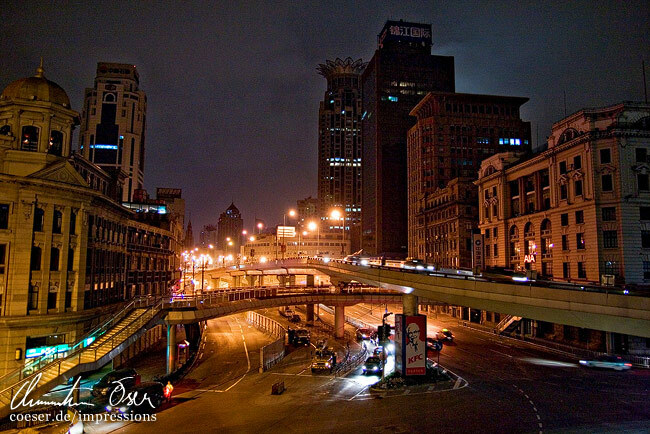 On the streets of Shanghai after sunset. Auf den Straßen Shanghais nach Sonnenuntergang. 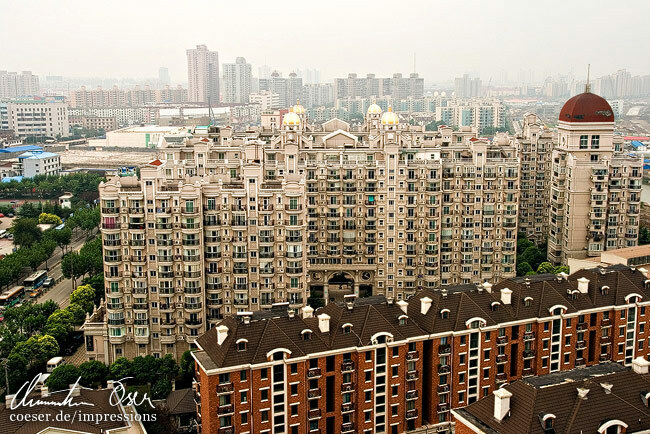 Typical high rise appartment buildings. 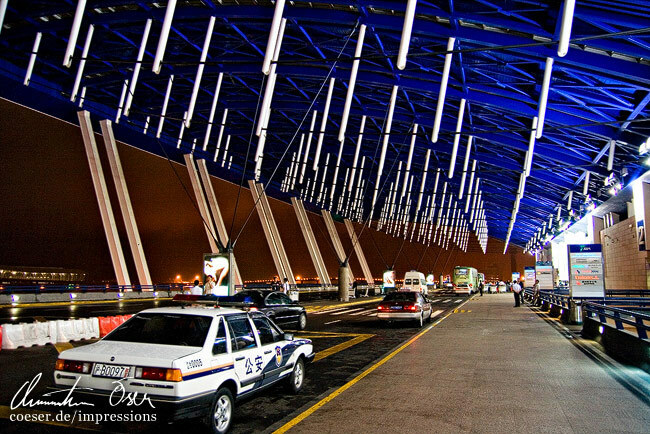 Taxis are waiting at the entrance of the Shanghai Pudong International airport. Taxis warten vor dem Eingang des Flughafens Shanghai Pudong International. 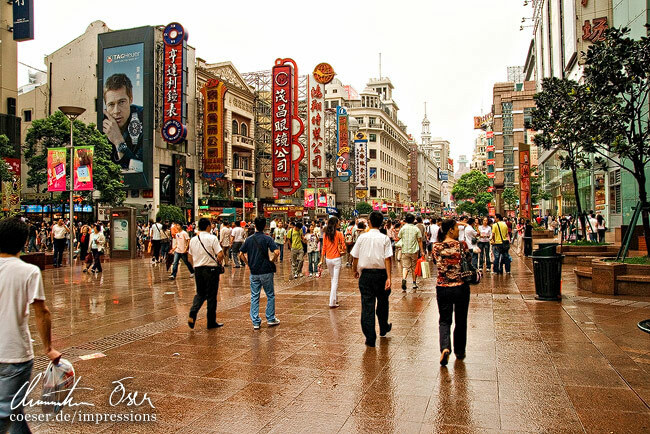 The Nanjing Road, one of the busiest shopping streets worldwide. 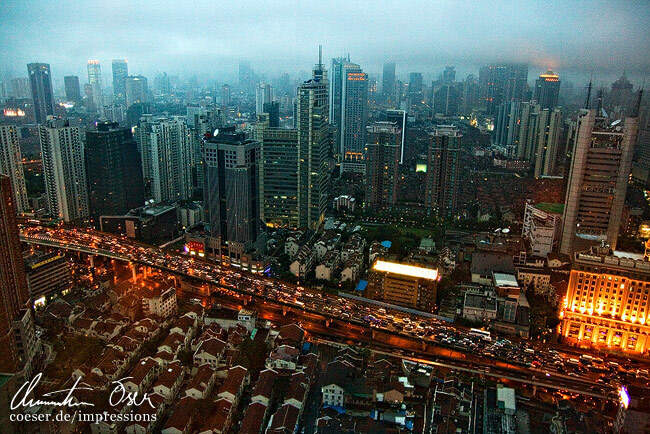 The Nanjing Lu, eine der größten Einkaufsstraßen weltweit. A typical street direction sign. 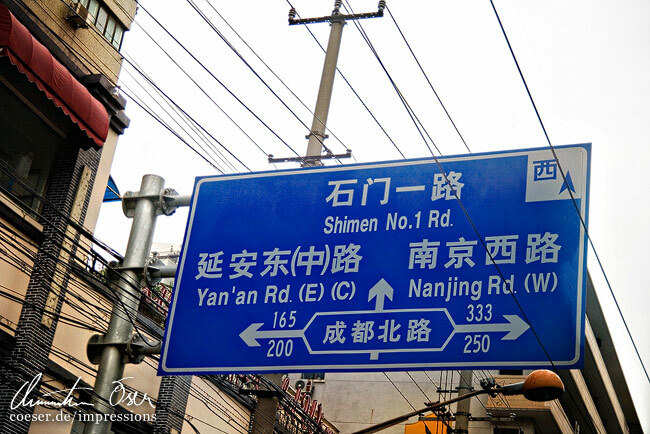 Ein typisches Straßen-Wegweiserschild in Shanghai.